14069.pdf - Pages: 772 - 14069 Engineering Aid 3 - Covers the following topics: mathematics and the units of mathematics; drafting equipment; drafting fundamentals and techniques; geometric construction; drafting projections and sketches; wood and light-frame construction; concrete and masonry; mechanical systems and plans; electrical systems and plans; construction drawings; elements of surveying and surveying equipment; direct linear measurements; field survey safety; horizontal control; direct leveling and basic engineering surveys; material testing for soil and concrete; and administration. 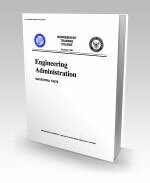 14070.pdf - Pages: 520 - 14070 Engineering Aid 1 - Discusses the principles of administration; organization and function of an EA1 in an NMCB operations department; fundamentals of geodesy and field astronomy; classification of soils by sieve analysis and according to the USCS; concrete design; bituminous mix design; soil stabilization and design. 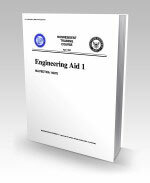 14071.pdf - Pages: 594 - 14071 Engineering Aid 2 - Discusses the basic knowledge of the materials and methods of construction used for heavy timber, structural steel construction, and mechanical and electrical systems; horizontal construction; development and use of construction drawings and specifications; checking and editing construction drawings; planning and estimating manpower, material, and equipment quantities; care and adjustment of surveying equipment; field tests and adjustment of surveying equipment; obtaining and converting field notes into topographic maps; computing areas by DMD and trapezoidal rule; techniques of computing horizontal and vertical curves, level, and traverse; procedures for land, topographic, and triangulation surveys; and testing soils moisture content, liquid limits, specific gravity, compaction, and density.